Finding Magic at Perfect Magic! So you saw a magic trick being performed on Youtube or on TV and thought it was great. The problem is, they didn’t tell you the name of it. We usually get a call from the viewer saying, “I saw this great trick on TV. They did …..whatever. Our response generally is “What is the name of the trick?” and of course they don’t know. The person would tell me they tried to find it on our web site but couldn’t. If you are computer savvy, then you will know this. I thought I was the only one in the world not to know this, but I get such “thank yous” from people after giving them this little tip, that I think I should share it with you, just in case. When you go to our little search box under Perfect Magic and you write in the word “mental”, it will list every trick that has mental or mentalism in the TITLE. BUT if you go to the perfect magic Google search box beneath it and click on the magnifying glass at the right, it will give you every trick, book, DVD, and accessory, that has mental or mentalism in the description as well, and many mental items do not have the word mental in the title, like Electric Touch for example, and there is also a line or two from the description. If you click on a title you like, the item comes up complete with photo, video if there is one, and full description. I use it all the time and it cuts down on a lot of frustration. I hope the info will be helpful to you, and will make your navigation through our site a lot easier. Wednesday March 13th, 2013 Mike Close, his wife Lisa, and daughter Ava, walked into our magic shop. They are to blame for my blog being a day late. We had such a great visit reminising. Mike was here in 1994 , that’s almost 20 years ago, and when they were walking in I thought it was just a family looking to get some tricks for their little girl , who is 6 years old and very cute and smart. He came over and said, Hi, I’m Mike Close. It took but a second to adjust my lenses and of course it was Mike close. Just because the hair changes colour (as did mine) and gets a little thinner, is no reason not to recognize someone immediately! Shame on me! There was so much to talk about. Mike, for those of you who are unaware, is the editor of M.U.M. magazine and his wife, Lisa, is the graphics designer. M.U.M. is a monthly magazine that goes to some 6000 plus members of the Society of American Magicians. They are doing a remarkable job with the magazine. If it wasn’t a Magic Magazine, it would surely be worth of a prominent place in any store, supermarket and anywhere magazines are sold. 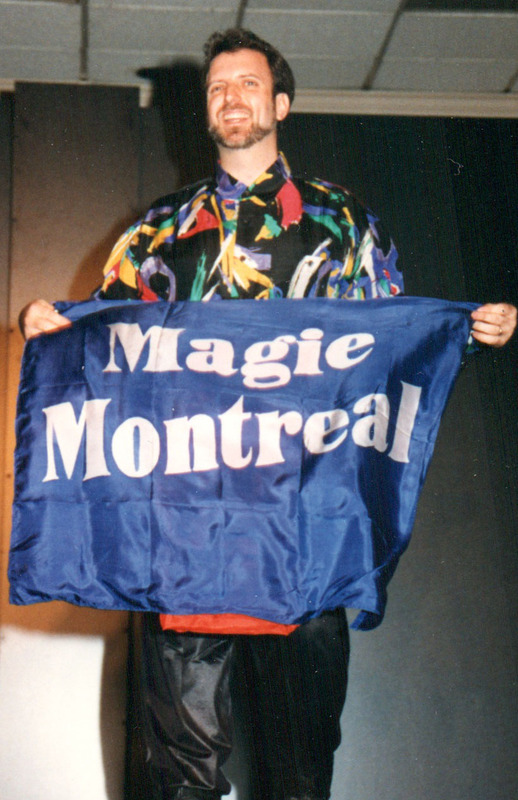 Mike was a featured performer at the 1994 Magie Montreal. Apart from doing CloseUp and a Lecture, he was the M.C. for the gala stage show SUnday afternoon, when Simon Lovell went a little over time, (like doing 32 minutes, when he was supposed to do only 12), not that he wasn’t hilarious but Juliana Chen, the next performer, was waiting in the wings, fully loaded with costumes, masks and cards waiting to go on and like a true por, she waited patiently all that time. Phil was beside himself, not to mention Mike. They had to restrain each other from going out on stage and bodily dragging him off. (In retrospect, Phil wonders why they didn’t). It took a long time, but Phil forgave Simon when he was a last minute substitute for a performer who had to back out, and Simon behaved and did exactly 12 minutes. Besides all the magic stories Mike is also a top notch piano player and musician. Lots of stories from both Mike and Phil. It was a great visit and Ava was patient, all things considered. It was the first time we met Lisa and the whole visit was a delight. Our blog is called Perfect Magic Then and Now, so we took a photos of Now, and and also added some from Then. Were you there? Do you remember? Mouse over the photos to enlarge and see the names.